Nobody will sing the blues when you give them this replica BB King hollow body guitar ornament this holiday season. It's modeled on BB King's favorite semi-acoustic guitar and fitted with details that give it incredible authenticity right down to the frets and the electric pickup. 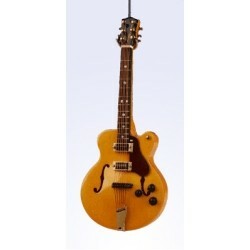 The BB King-style hollow body guitar personalized Christmas ornament is crafted from wood and given a durable finish to ensure this piece will maintain its handsome good looks through the years. It's just one of the guitars you'll find in our musical instrument ornaments, and we send it to you in our exclusive black velvet drawstring bag. Themed Ornament Dec 29, 2015 Val O.
BB King Fan Oct 28, 2014 Shaunie B.